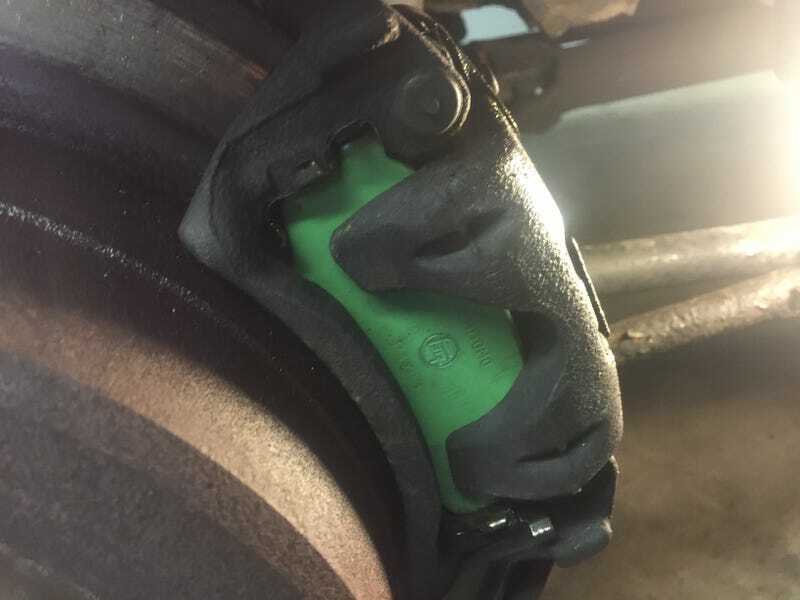 I don’t know why the good people at Toyota decided to paint the backs of my Land Cruiser’s new brake pads green, but I 100% support it. The brakes went from fine to terrible real quick. It was totally quiet on my drive into work, then it sounded like gravel on the way home. With that going on, I talked to a friend of mine at a local Toyota dealership and picked up a full set of OEM pads. I bought 100 series fronts, because apparently they drop right in and are thicker with more pad area. We started late, so we only got one side done tonight...took an hour, and 15 minutes of that was getting the damn wheel off the hub. Tomorrow when we do the other side I bet it’ll be half an hour. I also got to use my new jack, one of those yellow Harbor Freight three ton ones. I knew my old jack sucked, but I was never really aware of exactly how much it sucked until I used this one. Two pumps to get it up to the axle, one more and the tires are off the ground. Next thing is going to be a set of SOR seat covers and a new steering wheel, mine is gross.